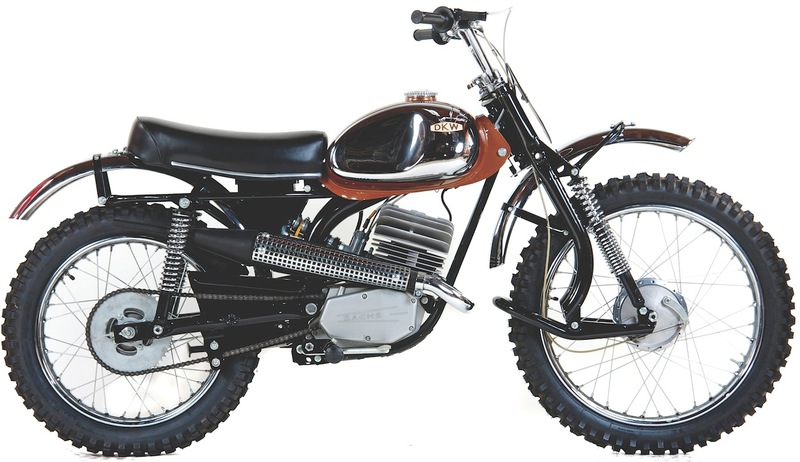 The German-built Sachs/DKW 125 was one of the first popular purpose-built 125 motocross bikes in America. When motocross exploded in the USA in the late 1960s, the choice of good entry-level machines was limited to Hodaka Ace 90s, Kawasaki Green Streaks and a potpourri of oddball brands. European brands were the first choice of aspiring 125-class motocross racers, and for a brief window the $748 DKW was at the top of the list with its rugged, motocross-inspired styling. 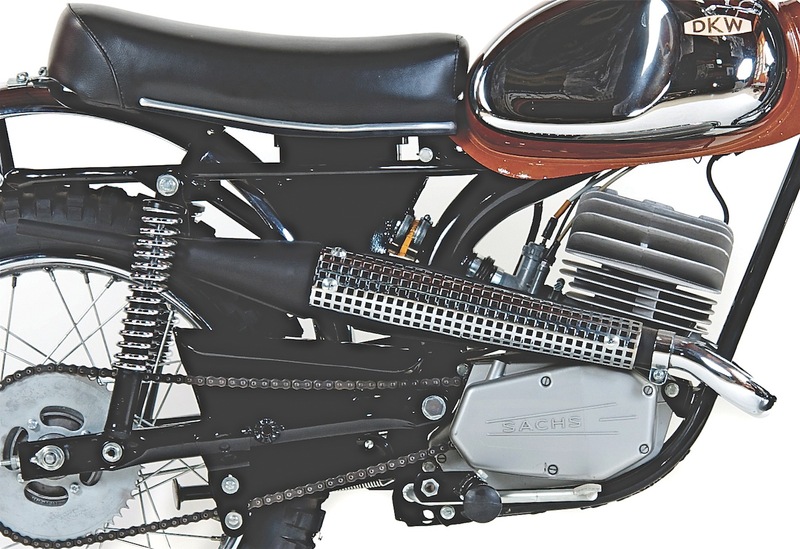 The Sachs five-speed engine had huge cylinder fins and excellent power. When combined with the DKW’s dual-cradle frame, leading-link forks and Boge shocks, the DKW was right on the mark for the U.S. market. Further helping DKW sales was very effective U.S. distributor Ted Lapadakis. DKWs were nearly bulletproof (with the exception of the Sachs engine’s many false neutrals). The shifting problems were mitigated by the Koba shift kit, proper adjustment and replacing worn-out transmission parts. DKW, or Dampf-Kraft Wagen (German for steam-powered vehicle), goes back to 1916 when Danish engineer Jorgen Rasmussen founded a factory in Saxony, Germany, to build a steam-driven car. By the 1930s, DKW was the world’s largest motorcycle manufacturer. For motocross, the machines were originally called Sachs 125s. Sachs, who also supplied engines to Penton, Monark, Hercules and KTM, merged with DKW in the ’60s, and by 1970 the Sachs 125s were rebadged as DKWs. The mid-’70s saw DKW fall behind. The leading-link forks were dropped for telescopic forks, and the Sachs transmissions were improved, but bikes were no longer relevant and fell from the scene. DKWs are quite low on both collector and AHRMA racers’ list of desirables. 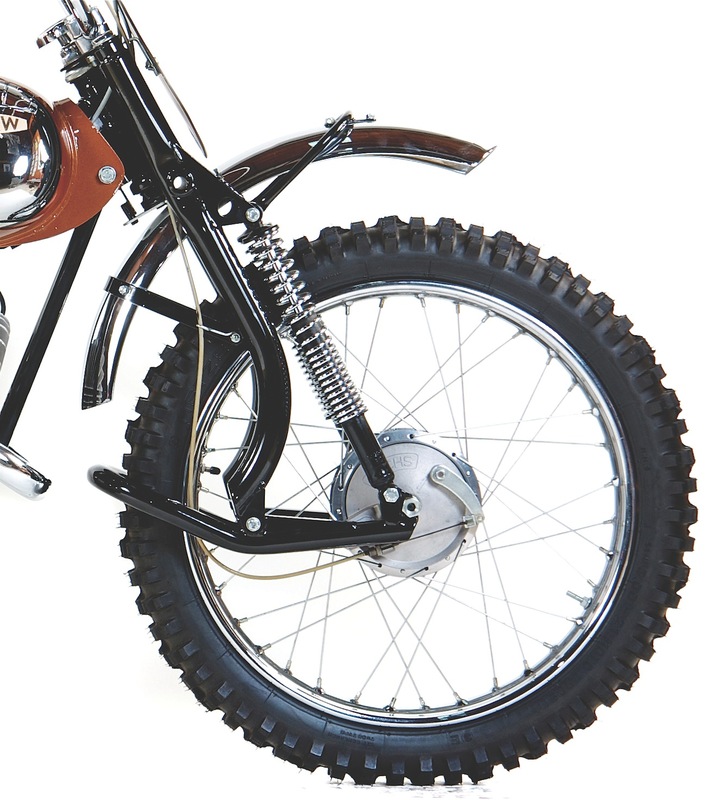 The beautiful Early Years of Motocross Museum example pictured here was purchased from MXA publisher Roland Hinz for less than the cost of its restoration—$4500. Don’t pay more than $2000 for a good, unrestored example. Five-speed DKW/Sachs from 1968 to 1971 were available in 100cc and 125cc versions (and in enduro, motocross and enduro-street legal models). In 1972, six-speed models were introduced. DKW restorations fall into the “highly challenged” category. Try to find as complete and original a machine as possible, as body work and trim parts are hard to find. The leading link version is more collectible. Look for an original fuel tank, preferably with badges, as they are nearly impossible to find. Also look for chrome fenders, unmolested Bode leading link forkss, Magura controls and a stock pipe (with heat shield). The Sachs engine parts are not as hard to find. Contact Alan Buehner at (216) 651-6559 or Mel Raines at (702) 896-8827.